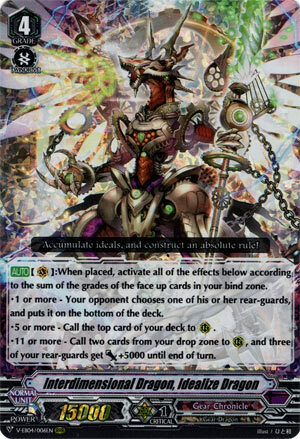 [AUTO](VC):When placed, activate all of the effects below according to the sum of the grades of the face up cards in your bind zone. • 1 or more – Your opponent chooses one of his or her rear-guards, and puts it on the bottom of the deck. • 5 or more – Call the top card of your deck to (RC). • 11 or more – Call two cards from your drop zone to (RC), and three of your rear-guards get [Power]+5000 until end of turn. Surprise, you thought I’d review Mystery-flare this week! Not this time. Well, both will take up space in the deck either way, so I’d just split it with two of this and two Mystery-flare. Obviously since this is easier to proc most of the time this will go first, but even only one bind is still a free -1 to the opponent. The rest of the skills are basically to be used as the board requires you to, but try not to rush blindly to it unless you’re sure you got the resources. As for perma-riding any of the Grade 4s, only do so if you need the defense, because gaining more Force Gifts from Lost Legend is probably going to be too good to pass up.